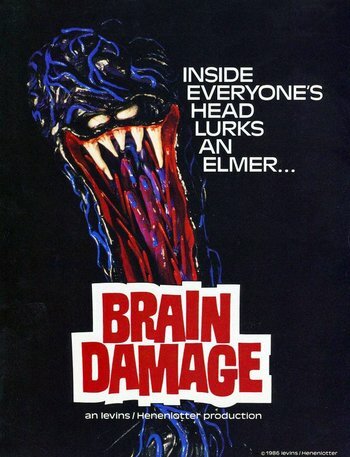 Brain Damage is the story of Brian (Rick Hurst), a young man who stumbles upon Aylmer (John Zacherle), an evil Muppet worm demon who offers him drug-endued bliss. The catch? While Brian's high, Aylmer burrows himself into the heads of those around them and literally eats their brains. While it takes Brian a while to notice he's being used as a vehicle for murder, he eventually begins trying to fight back. All the while, Aylmer's former "owners" take efforts to recover him and continue to pump the drug out of him. It was directed by Frank Henenlotter, the guy who did Frankenhooker and Basket Case. Brain Food: Aylmer feeds on other people's brains. The Cameo: Rick has a brief encounter with another possessor of a tiny evil puppet—Duane Bradley, from Henelotter's Basket Case films. Fantastic Drug: Aylmer gives this to Brian. Giver of Lame Names: Brian initially believes Aylmer is the victim of one, when confronted by Aylmer's ex-keeper. Brian: Elmer? You named it Elmer?! Going Cold Turkey: Brian attempts this towards the end of the film. It doesn't take. Info Dump: A massive one, midway through the movie, as one of Aylmer's keepers recites the parasite's long, long history. More Teeth than the Osmond Family: One wonders how the hell Aylmer fits the drug-pump in his mouth given the sheer volume of teeth he has. Mushroom Samba: Pretty much every time Brian gets high has at least elements of this, but his first two hits are the most potent. Villain Song: Aylmer appropriates "Elmer's Tune " to taunt Brian as he goes into withdrawal.